Like what you see? Hire me NOW for any type of | freelance | projects and get in touch! READY!? 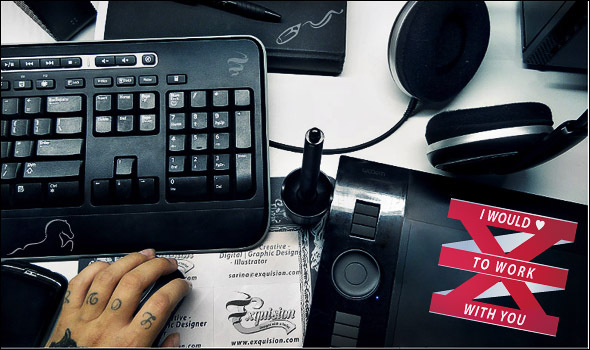 | Behind the name: Exquision hides a story about the Creative - Digital | Graphic Designer - Illustrator. Sarina Meester | Founder of the Studio: Exquision. FROM THE START.. With her lifelong passion for Graphics, she followed a 4 year long course entitled: "MultiMedia Design" at the school of Art and Technology in Enschede. During this training, she explored a lot more than Graphic design, including interesting things such as Illustration | 3D | Music | Photography | Video | Web Design. Beside this she started working part-time and Freelance for various clients and stayed up days and nights behind her screen to perfectionize her work and to improve her skills. After successfully completing her education, gaining work experience and winning Awards, graphic design remains her biggest craze that she'd love to turn into her Profession. "I have a strong passion for Graphic Art & Fashion and this passion is a driving force in my dedication and improvement | True Love." AND SO After hours..days..weeks..months of brainstorming and wasting two hundred tons of paper the Creative name: Exquision(exquisite | explosion) was born full of strength and movement. It's a vision and the style for the art pieces, including the motto: "Designs with a Twist". The designs are dangerous like a tornado | exquisite like a good cup of coffee | explosive like a bomb | stirred up with a piece of love! MEANWHILE.. Sarina is both available for Freelance or Fulltime work! Interested in her experience?! You can download her full CV HERE | or the Dutch version HERE. TIME TO GO! Want to know more? Just send a message via the Contact page!